Water is the most precious of all commodities. Water is the source of all life. In urban areas, water is available at the turn of a tap. We take water for granted. Have you ever had your water supply cut from your home? If so, you will become aware very quickly how important water is. No water means no showers, no clothes washing, no toilet flushing and so on. Water is a limited resource. Australia’s homes and industries continue to use more water, which has pushed prices higher and higher over a number of years. Prices look almost certain to continue rising along with this increasing demand. Have you ever considered installing a rainwater tank? There are so many benefits from capturing your own rainwater. In fact, when it rains your roof collects the water. But it then flows into the sewer system and has gone forever. Rainwater collection systems allow you to take advantage of the free supply of rainwater that falls on your roof. Rainwater is completely safe to drink and is used in many rural homes as their only water supply. This means that you can have clean, drinkable water without any on-going purchase costs. As well as the water being fresh and free, rainwater isn’t subject to the restrictions that might be put on your mains supply. You can continue to use water as you wish during drier periods. Using rainwater can reduce water bills, provide an alternative supply during water restrictions and help maintain a green, healthy garden. Depending on tank size and climate, mains water use can be reduced by up to 100%. The size tank required all depends on the application you will be using your tank for. Whole House Usage This requires a minimum of 10000 – 20000 Litres. This can be connected to your whole house to provide zero reliance from mains water. Great for the environmental conscious person who also wants to save on water bills. 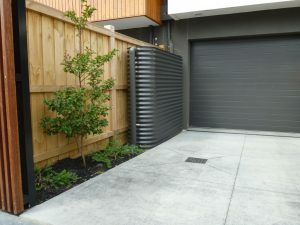 Part House Supply To connect your toilets, washing machine and an outside garden tap to your tank we would recommend 2000 – 5000 Litres. Five Star regulations for new homes require 2000 Litres to be connected to toilets, however anything over this is yours to “splash around” with.